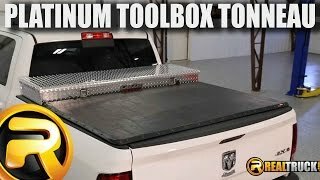 The Platinum Toolbox tonneau cover works with most 18-20" toolboxes. This allows full access to the toolbox while keeping the cargo in your truck bed protected. 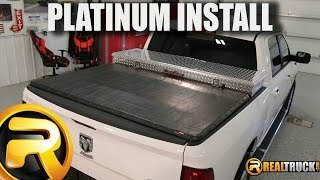 The one-piece, over the bed rail design of the Platinum Toolbox tonneau helps it shed virtually all water in even the most extreme weather conditions. NOTE: For heavy rain, the support bows shed maximum water in the HIGH position. The TuffKlamps are a no-drill install, and they feature two adjustment levels for the support bows. HIGH for hotter weather or maximum water shedding, and LOW for cold climates. Heavy-duty aluminum support bows are anodized for a premium finish and feature spring loaded ends for fast, secure on and off use. The bows are designed to be wide and flat for the best strength to weight ratio. 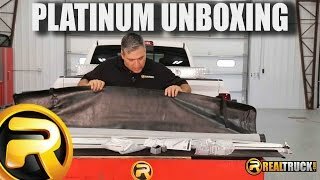 The Platinum Toolbox tonneau uses high-end materials like anti-curl corners and a thick polymer underside for the vinyl cover. The rails and bows are made from durable, anodized aluminum. Extang backs this cover with an amazing limited lifetime warranty on the frame and 10 year warranty on the vinyl. All metal frame design with stainless steel and brass snaps that are guaranteed to not break. L-Channel fits against your tool box to create a perfect fit, and provides a tight seal for water drainage between the tool box and tonneau cover. Spring loaded bows and adjustable snaps keep the heavy duty vinyl tarp tight in all climate conditions. 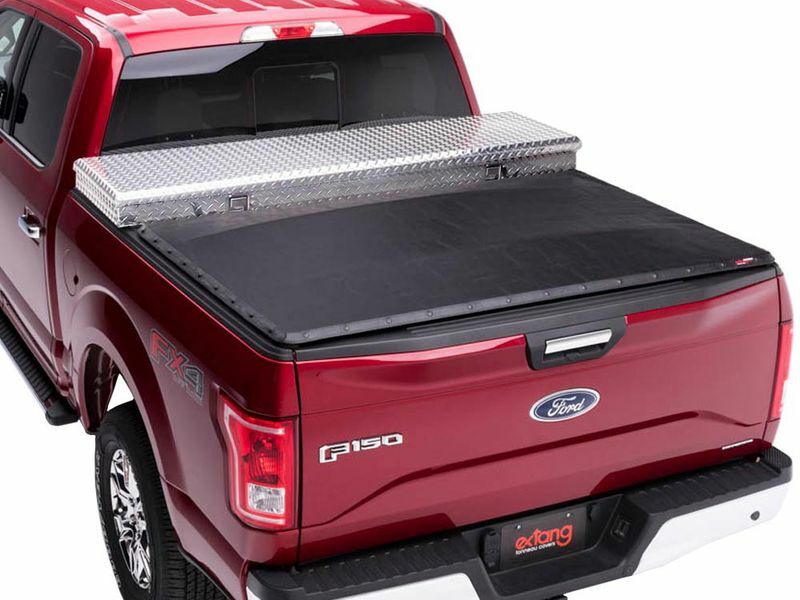 The Extang Platinum Toolbox Tonneau Cover is designed to work with standard 20" toolboxes. Does not work with plastic or low profile tool boxes. Please call us to guarantee the fit. Fiberglass reinforced corners and snaps will always look smooth and will not rip out. Fully adjustable snaps make it easy to snap the tonneau cover into place and keep the tarp in place. The spring loaded bows quickly spring off and on with 1 hand and feature 2 height adjustments for different climates to keep the tonneau cover tight. Installs easily with no drilling - clamp the tonneau frame onto your bed rails and the frame quickly slides and clicks together to lock into place. Install the Extang Platinum tonneau cover with non-standard sized tool boxes by measuring and adjusting the depth of the L-channel header.